direct driver DLL for faster communications and higher CAN bus loads. threaded CANUSB DLL (BETA availibe now). CANUSB is a very small dongle that plugs into any PC USB Port and gives an instant CAN connectivity. 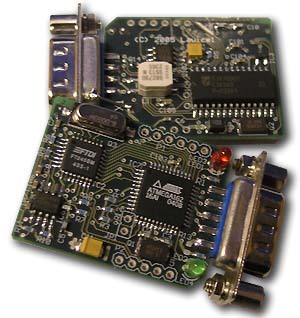 This means it can be treated by software as a standard COM Port (serial RS232 port) which eliminates the need for any extra drivers or by installing a direct driver DLL for faster communications and higher CAN bus loads. Sending and receiving can be done in standard ASCII format. Length: 55mm, Width: 36mm, Height: 16mm. Blue Transparent Case, 1 meter shielded USB cable. The module plugs directly into a standard USB port and provides a standard DB9 male output to CAN systems according to CiA (CAN in Automation) recommendations (CAN in Automation) DS102-1 recommendations. It is self powered from USB. It consumes max 100mA, but normally not more than 60mA (this depends on BUS load and eventual CAN cable errors etc.). 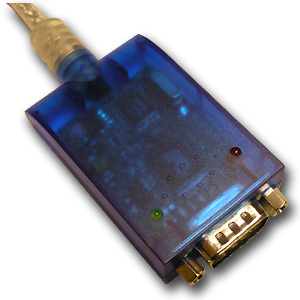 Use your own RS232 LIB/drivers (in e.g. Visual Basic, Deplhi, C++ etc.) together with the free Virtual COM port driver or use the free Direct driver DLL (see Download page for drivers). Works on Windows and Linux platorms. Easy to migrate from CAN232 to CANUSB with some small software changes. Free Windows Threaded CANUSB API DLL, write applications in a snap. power on pin 9. Use only CAN_L (pin2), CAN_H (Pin7) and CAN_GND (pin3). The CANUSB Manual below contains only commands used for sending/receiving CAN frames etc. and you need to download one of the Windows XP installation guides from the Download page in order to get instructions how to install the CANUSB with USB Drivers. You will also find USB Drivers there. Sample programs in C, C++, Visual Basic, Delphi, Linux etc. can be found on the Download page. We are currently working with a DLL which will in turn "talk" with the D2XX DLL from FTDI. This threaded DLL will include Open, Read, Write & Status functions and will make it quick and easy for customers to make their own applications without understanding on how to parse commands and get into how the D2XX driver work. Beta is availible now. Initial tests with VB6 using this DLL shows that the CANUSB is really fast and can receive 5000+ frames per second without loosing any frames. We will of course test this more in depth, but we are proud to mention it allready! Looking inside the CANUSB, you find a dense 4-layer printed circuit boards with parts on both sides of the PCB. The CANUSB will be firmware upgradable through the USB interface, so customers easily can update firware when we release a new improved software or new functions in the software. CANUSB is also CE ceritified, which many other similar products are not.